I see this come up over and over again. People saying that a task is running in the background and they think it is killing their battery or hogging all of their memory. So their natural reaction is to download a program made to kill tasks. Here’s the thing… you are likely doing more harm than good by killing tasks that aren’t ready to end. I was the same way when I first got my CDMA Hero. There were tons of things running that I didn’t want so I just kept killing them. After a few weeks I realized that if I stopped using a task killer (and totally uninstalled it in fact) my phone actually began to run better! The applications would close themselves and things just seemed to be running better. I get that there may be short term benefits from clearing a task, but you should still take the time to read through this. Here is some information directly from Android’s developer page. I have put the important parts in bold. This is quite a lengthy read but honestly I think it’s important. If you want the full read then you can check out the dev page here. If you just want the quick TL;DNR version then scroll to the bottom. A content provider is active only while it’s responding to a request from a ContentResolver. And a broadcast receiver is active only while it’s responding to a broadcast message. So there’s no need to explicitly shut down these components. Components might also be shut down by the system when they are no longer being used or when Android must reclaim memory for more active components. If the user leaves a task for a long time, the system clears the task of all activities except the root activity. When the user returns to the task again, it’s as the user left it, except that only the initial activity is present. The idea is that, after a time, users will likely have abandoned what they were doing before and are returning to the task to begin something new. 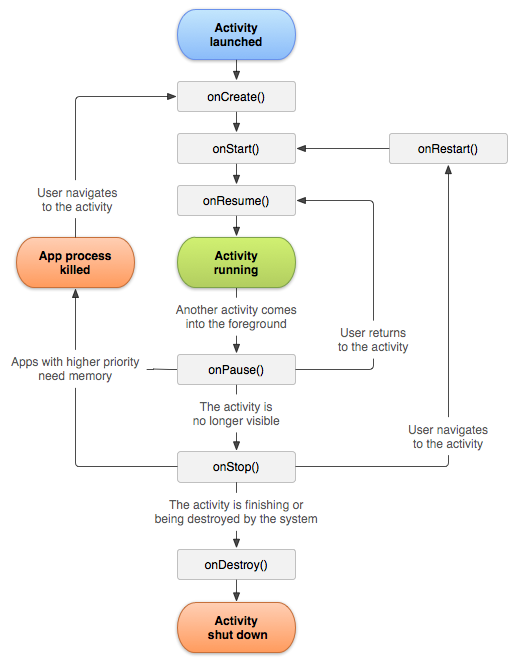 It is active or running when it is in the foreground of the screen (at the top of the activity stack for the current task). This is the activity that is the focus for the user’s actions. It is paused if it has lost focus but is still visible to the user. That is, another activity lies on top of it and that activity either is transparent or doesn’t cover the full screen, so some of the paused activity can show through. A paused activity is completely alive (it maintains all state and member information and remains attached to the window manager), but can be killed by the system in extreme low memory situations. It is stopped if it is completely obscured by another activity. It still retains all state and member information. However, it is no longer visible to the user so its window is hidden and it will often be killed by the system when memory is needed elsewhere. If an activity is paused or stopped, the system can drop it from memory either by asking it to finish (calling its finish() method), or simply killing its process. When it is displayed again to the user, it must be completely restarted and restored to its previous state. The foreground lifetime of an activity happens between a call to onResume() until a corresponding call to onPause(). During this time, the activity is in front of all other activities on screen and is interacting with the user. An activity can frequently transition between the resumed and paused states — for example, onPause() is called when the device goes to sleep or when a new activity is started, onResume() is called when an activity result or a new intent is delivered. Therefore, the code in these two methods should be fairly lightweight. Android is hard coded to automatically kill a task when more memory is needed. Android is hard coded to automatically kill a task when it’s done doing what it needs to do. Android is hard coded to automatically kill a task when you haven’t returned to it in a long time. Most services (while possibly running in the background) use very little memory when not actively doing something. A content provider is only doing something when there is a notification for it to give. Otherwise it uses very little memory. Killing a process when it isn’t ready only causes it to have to reload itself and start from scratch when it’s needed again. Because a task is likely running in the background for a reason, killing it will only cause it to re-spawn as soon as the activity that was using it looks for it again. And it will just have to start over again. Killing certain processes can have undesirable side effects. Not receiving text messages, alarms not going off, and force closes just to name a few. The only true way to prevent something from running at all on your phone would be to uninstall the .apk. Most applications will exit themselves if you get out of it by hitting “back” until it closes rather than hitting the “home” button. But even with hitting home, Android will eventually kill it once it’s been in the background for a while. Questions? Concerns? Feel that I’m wrong? Comment below and let’s discuss! One thing that I forgot to even address here is that memory works a bit differently in linux than it does in Windows. In general the way memory works is you really only need as much as you plan on using. So if your combined running programs use 100mb of memory, 150mb is more than enough. There is no need to clear what’s running in memory before you hit that 150mb cap. Now in Windows it seems that the system performs a bit better when you have less stuff in memory, even if it’s not full. No doubt those who have been on computers for a while will remember there used to be programs that could clear your memory in Windows also. I have also seen people incorrectly assume that the more memory in use, the faster their battery will die. This would actually be more attributed to the amount of processor cycles (CPU %) going on and not the amount of memory being taken up by a certain program. However, that does lead to a good point! When can a task manager be a good thing?? To help you determine what IS slowing down your phone; what may actually be draining your battery faster. That is actually what helped us discover that there appears to be a bug still left over from 1.5 that is causing slow downs on our CDMA Hero’s even today. While an item using up memory isn’t going to hurt things, an item chewing through your CPU absolutely will. Now I still don’t suggest using a task killer to kill a program that is using up your processor (unless of course it is a zombie process that is going crazy, but you should probably just reboot in that case). But it can help you see what’s going on with your phone. I hope this has helped someone. With all of that said… I always encourage experimenting. It is your phone, and you can do with it what you please. If you swear that a task killer makes your phone amazing, then by all means use it! Thanks for reading.